Give your critical sensors up to 5X more power with Alta Devices AnyLight™ power technology. Our thin, flexible, and lightweight cells can be integrated into sensors for home, building, or factory automation. 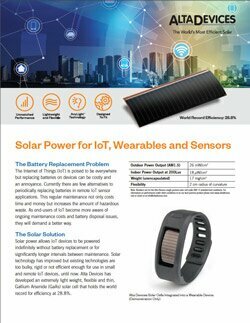 The Internet of Things (IoT) is poised to be everywhere but replacing batteries on devices can be costly and an annoyance. Currently there are few alternatives to periodically replacing batteries in remote IoT sensor applications.